Claude Lanzmann who died in Paris on 5 July this year at the age of 92 will forever be remembered for ‘Shoah’, his extraordinary 1985 nine-and-a-half-hour epic documentary that changed the world’s understanding of the Holocaust. The Shoah films compelled through touching, often shocking individual testimony, the result of eleven years of research and filming. Less well-known than the French filmmaker’s engagement with the European holocaust experience and his controversial support of Israel, is his fierce anti-colonialist activism against France’s colonial war in Algeria and his close encounter with Frantz Fanon. Lanzmann, at the time a radical journalist and writer became significant during Fanon’s last year of life as an intermediary between the latter and his publisher and supporters in France. Notably Lanzmann organised a meeting in Rome in July 1961 between Fanon, Jean-Paul Sartre and Simone de Beauvoir, which resulted in Sartre’s famous preface to the The Wretched of the Earth, the manuscript of which Fanon had brought along to give to Sartre. 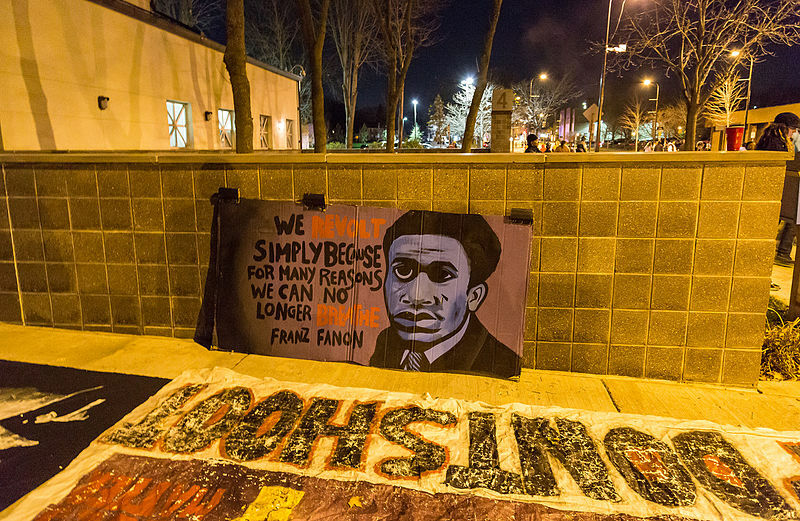 The physically and emotionally exhausting three days of intensive conversation were the first time Fanon met the French philosopher and activist, arguably his most profound intellectual influence. Lanzmann however had already had some months earlier an intriguing meeting with Fanon in his Tunis exile. In 1952 Lanzmann had become – at Sartre’s invitation – a contributor to the radical French publication Les Temps Modernes after his return from Germany where he had taught Philosophy at the newly-founded Free University of Berlin in 1949 and from where he had reported as a journalist. He was among those on the French left who took an ardent anti-colonialist stand against France’s colonial war in Algeria. In the autumn of 1960 Lanzmann signed the ‘Manifesto of the 121’ that supported the independence struggle, denounced the torture practices by the colonial forces and endorsed resistance to military conscription into the French army. He also testified for the defence in the Paris trial against the more practical-radical supporters of the Algerian FLN (National Liberation Front) known as the porteurs de valises for the suitcases they carried full of money and ammunition for the FLN. I sat on the floor next to the mattress where Fanon lay and listened to him talk about the Algerian revolution for hours, stopping several times when the pain became unbearable. I put my hand on his forehead, which was bathed in sweat, and awkwardly tried to dry it, or I held his shoulder gently as though by mere touch I might ease his pain. But all the while Fanon spoke with a lyricism I had never before encountered … as he propped himself up on his elbow and announced like a visionary that Africa, the Africa of his dreams would not experience the Middle Ages as Europe had, one could not but be carried along by his words, could only subscribe to his glorious utopian ideal. Even after his return to Paris weeks later, Lanzmann was ‘still completely carried away by this man whom I believed to be the keeper of the truth, and of the truth as a secret.’ In the meantime, Lanzmann had met several more times with Fanon, who was feeling better due to a brief remission of the cancer. They spoke about Fanon’s relationship with the FLN, and about Sartre and his book Critique de la raison dialectique, which had recently been published. With characteristic immense passion Fanon claimed that the fighters of the ALN (National Liberation Army) had actually read and engaged with Sartre’s critical discussion of revolutionary experience and impasse. Fanon organised a trip for Lanzmann to go and visit what he called the fighters in ‘the interior’, whom he had painted in glowing colours to his French guest. For Lanzmann, the first Frenchman to visit the area, the two-week trip to Ghardimaou on the border between Tunisia and Algeria was both enlightening and sobering. He realised that neither were these the true fighters of ‘the interior’, a guerrilla force operating inside the French colony, nor were they the famed peasant-warrior-philosophers of Fanon’s passionate portrayal. Instead, Lanzmann found the Armée des frontièrs, Algerian combatants and their leadership who had long ago crossed into the border zone; he also realised that their engagement with Sartre’s writing was limited to a seminar Fanon had given them on his recent visit to the border, his last political action and trip before the illness took full hold of him. None the less the French writer-activist was captivated by the men who had started out fighting in the Wilayah guerrilla zones in the Algerian interior, and planned to write about the trip on his return to Paris. This however was not to be. Shortly after having arrived back he had encounters with members of different factions of the Algerian liberation forces, and realised their bitter and violent differences. So, he kept the story to himself and did not write anything, Lanzmann began to see that the Algerians were victims of racist violence in their colonised homeland as much as in France, whom the small number of solidarity activists on the French left had unsurprisingly idealized. Despite his continued admiration for Fanon as a passionate philosopher-revolutionary and a warm and delicate person, Lanzmann’s impassioned anti-colonialism suffered severe disillusionment. Postcolonial Africa to him, as for many others, was a great disappointment. This was not the Africa of Fanon’s dreams, he declared in the Patagonian Hare, failing perhaps, to fully appreciate the critical power and insights of Fanon’s masterpiece, The Wretched of the Earth, which Lanzmann had helped to deliver. In that sense perhaps, a critical-sympathetic appraisal of one of the last great activist intellectuals of the French post-war left may help understand that what was perplexing about his life-long lived commitment, onwards from the eighteen-year old who joined the communist Résistance in occupied France. On the occasion of Lanzmann’s 90th birthday in November 2015, the Free University Berlin had invited him back to the place of his first job. During a two-day colloquium on his life and work he spoke eloquently and passionately about his experiences in Berlin just after World War 2. Characteristic were his comments on working with German students in the immediate post-war era, who were his contemporaries; the young men of course mostly former soldiers in the Wehrmacht (the German army from 1935-1945). Almost sixty years later Lanzmann still displayed considerable empathy with these young Germans despite the fresh unbearable pain he must have felt, having learnt just recently of the full extent of the Nazi atrocities. Interestingly too that Lanzmann left Berlin after a brief spell of teaching when the Alliance Française that paid his salary wouldn’t allow him to teach a course on antisemitism, which – he insisted during the 2015 entretien – had been specifically requested by his German students. It appears that the French authorities thought this might be too volatile. Sitting in the audience that evening I could not help thinking: What a great man, in all his complexity!